Youth participation has long been a focal point throughout the UN’s work. And the UN Youth Envoy helps to bring the needs, priorities, and rights of youth into the discussions on issues like sustainable development, peace and security and humanitarian action. 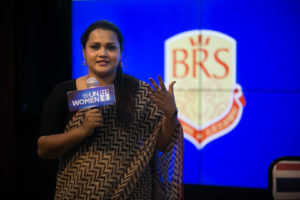 At a gender and peer education dialogue hosted by the UN Women China, reporter Feng Yilei talked to Sri Lankan Jayathma Wickramanayake, the second UN Secretary-General Envoy on Youth, who took office last year. Q：Since being appointed as the second UN Secretary-General’s Envoy on Youth, what have you been advocating and what have you achieved? A：The main work for me has been to mobilize young people to take actions towards sustainable development, promote young people as active peace builders in peace processes, empower the girls and young women. Moreover, bring attention to issues of gender equality and to highlight the role that young women can play in decision making, in political, social and economic life. One of the biggest achievements last year was the production of the UN’s youth strategy. And my office was asked to lead on the finalization of the youth strategy that we did with the inter-agency network on youth development which has 53 members comprising different UN agencies, funds and programs. Q: What is the significance of the UN’s program on youth? And what is the role of youth in the 2030 Agenda for Sustainable Development? A: First of all, we have an overarching understanding of what happens in the UN so that we can channel youth concerns and mainstream youth participation across all the work that occurs in the United Nations. It is imperative that we put the needs and the rights of young people at front and center of all conversations when it comes to development, peace and security, human rights or humanitarian work. Young people comprise the two parts or two elements of the SDG agenda. As young people, there are things that they can do on our daily bases that can contribute to the implementation of the 2030 agenda. And on the other side, young people do have a crucial role to play regarding being leaders of accountability. Young people need to hold our governments accountable. Q: How do you view gender equality and youth engagement coming together, both in a global context and China context? And how does gender equality play a part in the process of reaching the Sustainable Development Goals? A: It could be the national or municipal or country-level policies that formulate the implementation of the sustainable development agenda. It should be a holistic approach, and we need to empower women and girls in all these different areas to make sure that the 100 percent of humanity is contributing to sustainable development. Q: Young people also play a crucial role in impacting societal norms and entrepreneurship. How will your efforts on youth strategies help generate innovation? A: There are a lot of myths and misconceptions that overgeneralize young people and their lives. But the truth is that the majority of young people do not fit into these stereotypical categories. In fact, we are the generation that cares about our planet and that do want to change, and we don’t want to do it as usual. The Deputy Secretary-General of the UN said that women face glass ceilings, but youth face concrete ceilings. Some exceptional young people have broken these concrete ceilings. And the media also has an influential role to play in showcasing those positive stories and telling those stories to a broader public, to break those myths and misconceptions.